Hair: This once was my Talim wig. With a few bobby pins and a bun enhancer (cut open to make a tube) were used to give the hair some lift. Headpiece: The headband is silk with a little fabric paint for the stripes. The flowers are veg tanned leather painted with Martha Steward paint. The pink one has a barbecue skewer pierced into a foam ball covered in Model magic that is painted. I did some kanzashi with pink satin ribbon attached to another pink ribbon and added a leftover clignote bell at the end. Both flowers have floral wire holding the petals together and are fed through the headband then twisted to be secured. I reinforced the headband with flexifirm so it could hold the flowers. Necklace: I strung together the small stone beads from Michael’s. 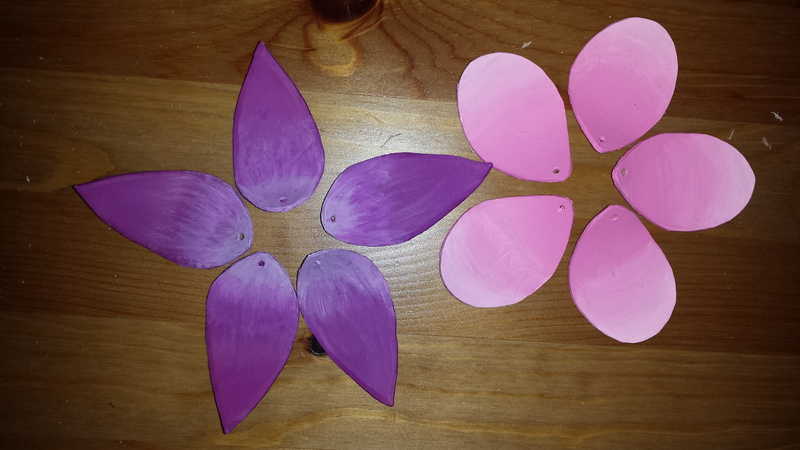 The large centre stone is for floral decorating and it is encased in Worbla. The teeth are made with Ultra Sculpey and placed on a Worbla base. Top: I used a La Vie en Rose bra as a base. I draped red pig suede over top and hand stitched it down to the bra. It closes with snaps in the back. Leather cord was used to string the smaller piece of leather underneath. 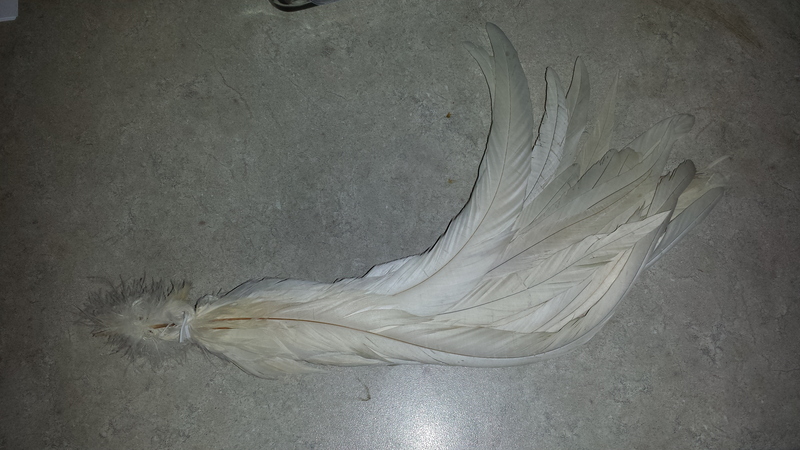 Feather pauldron: This is one of my favourite parts of the costume. The strap is leather and I cut the detailing with a swivel knife. The detail were coloured with Martha Stewart Paint. 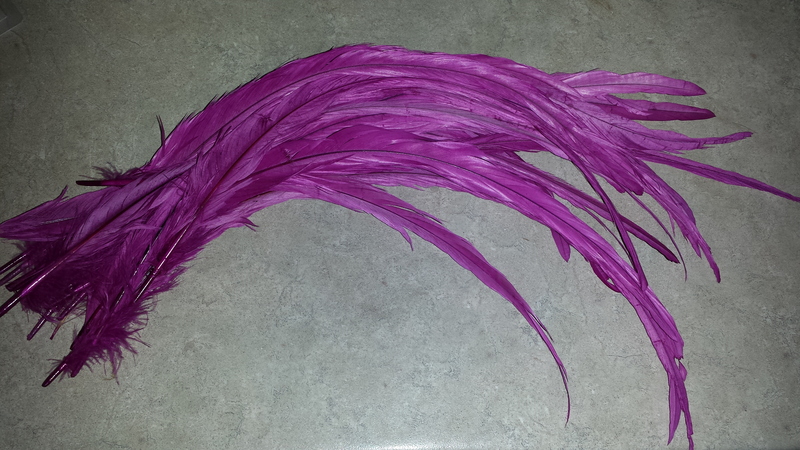 The long fushia feathers are rooster tail feathers that were acid dyed. 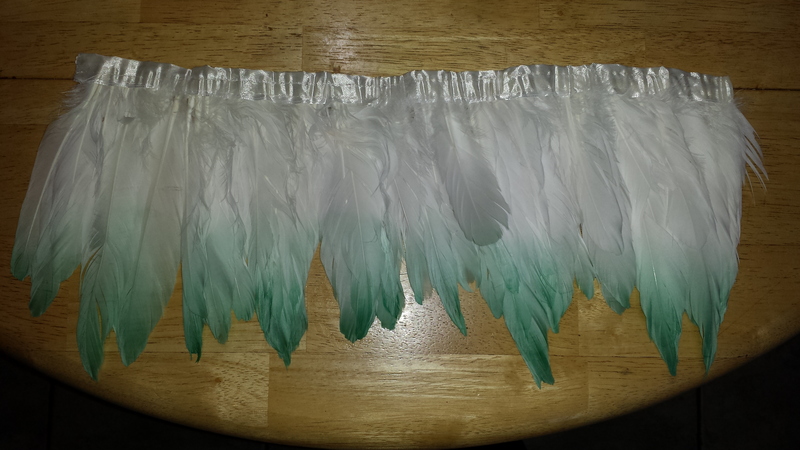 The white feathers are leftover trim from Ragyo that were dip dyed in emerald acid dye. 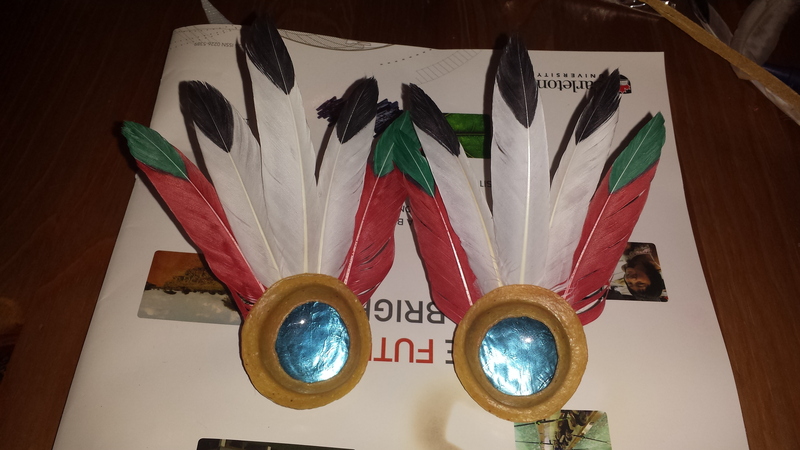 I trimmed 5 peacock feathers to attach the trim as well. 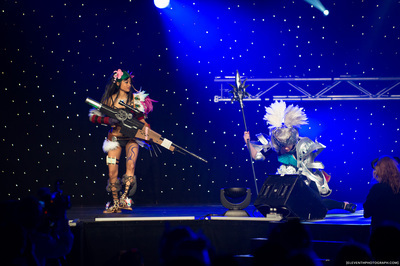 The pauldron is attached the bra with screw posts and is removable. Left Arm Club: The base is expandable foam that was carved into shape. Model magic was used to cover the base and make the claws. It is painted with a mix of acrylics and texture was with a sponge. 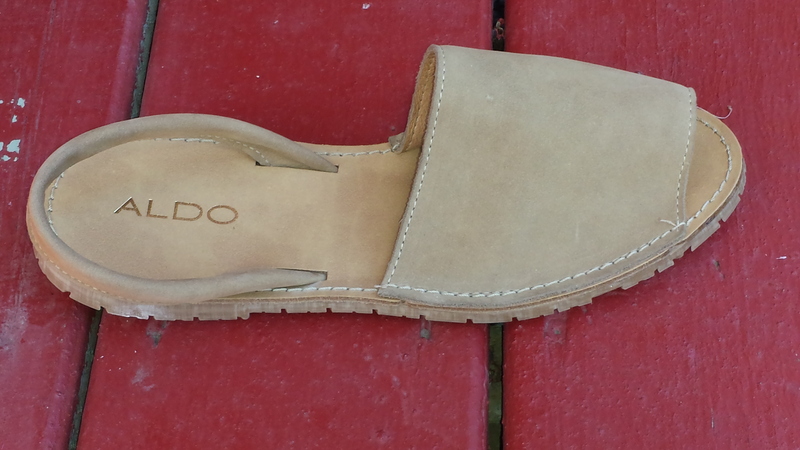 The strap is suede and rabbit fur with an embedded elastic. 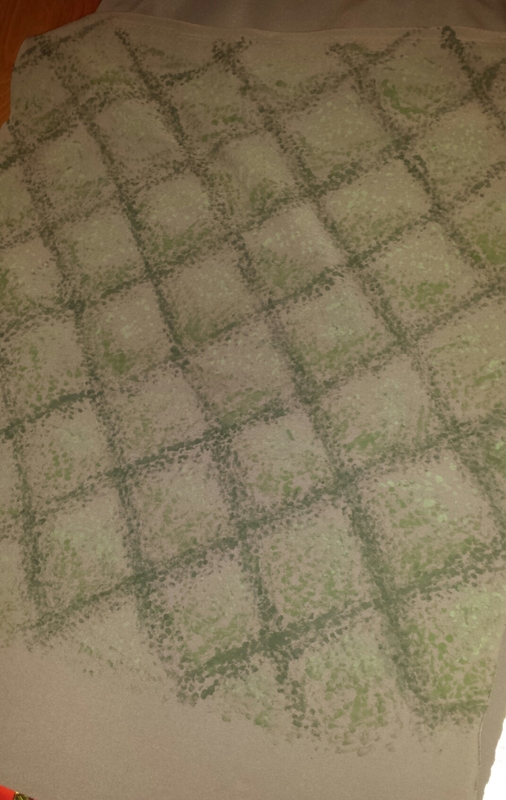 Right arm sleeve: The sleeve is a grey spandex I custom painted with a sponge to add texture. 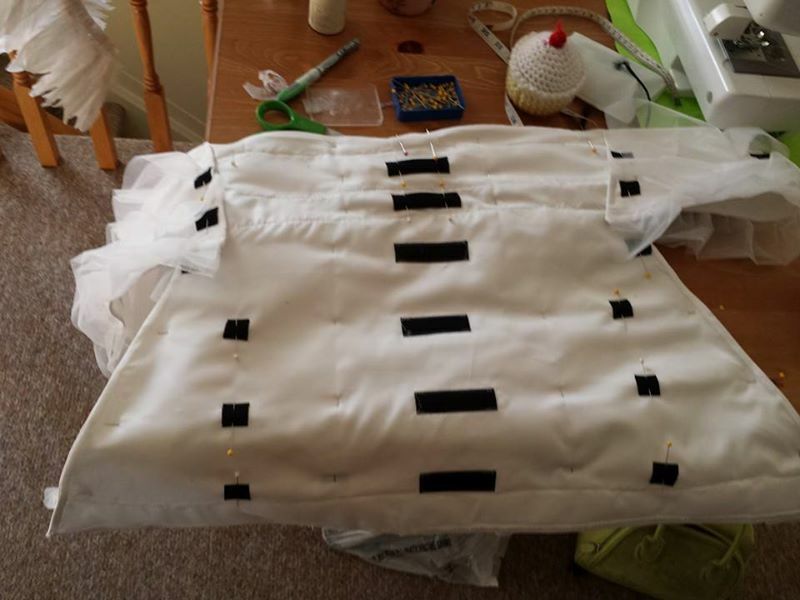 I stitched two pieces white faux fur together to get the hair pointing in opposite directions. An elastic band holds it up and a one inch leather strap was placed on top and held on by screw posts. Bracers and gloves: The gloves are leather, I bought them from eBay. 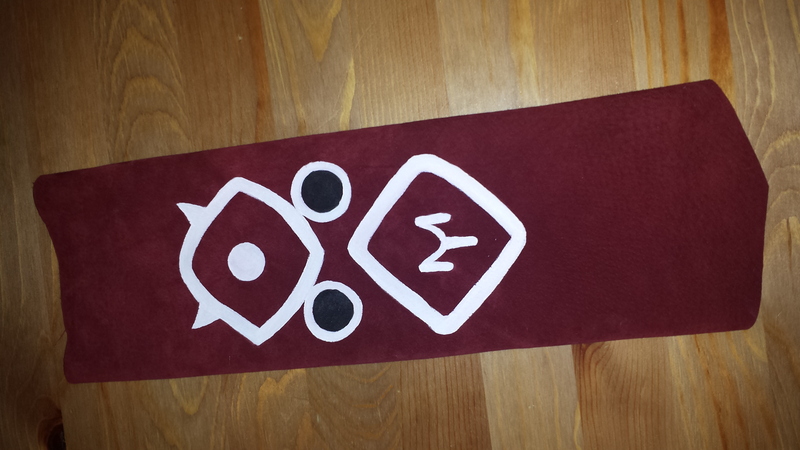 The left bracer has foam cushioning and styrene on top and is covered in pig suede with red lining underneath. Painted details were Martha Stewart paint. It is strapped down to another piece of brown pig suede with leather cord. The claws are worbla covered styrene. The right bracer has flexifirm as a base and has a polyester lining. The brown straps are lamb skin and the brooch is worbla/wonderflex. Belt and Pelt: I bought a brown leather strap and cut the detail with a swivel knife then bevelled (pounding in detail – like embossing) the entire design with a small 6mm tool. It was loud and time consuming but it made the design pop. The gold is Martha Stewart paint. The pelt is pig suede with a faux fur trim and has a pocket on the inside. 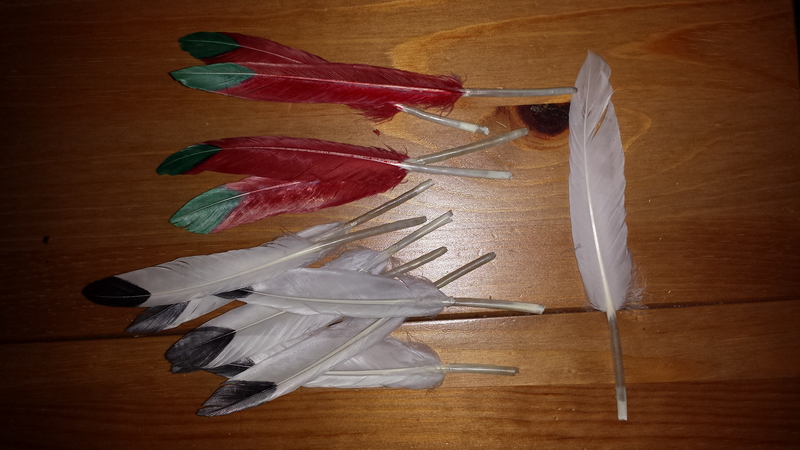 The feathers were coloured with Sharpies and are held on by double-sided tape. They need to be easily removable for transit. Buckles ont he belt and pelt are made of worbla covered craft foam. They are fastened by embedding floral wire in the back and hand stitching them down. The details were embossed with a hot knife tool. Leg Strap: This was also made with lamb skin and held on with double sided tape. I was happy that the tape worked well on the leather, which makes sense since it’s also skin. The green colour is also Martha Stewart paint. The bones were made of Ultra Sculpey and dark washed with dark yellow acrylic. Bodypaint: I used Mehron Paradise Makeup for the purple swirl design on my leg. It held up perfectly after sealing it with MAC pressed powder sealer. Socks: The top is rabbit fur and the bottom is lamb skin. I added eyelets and laced it up with thick black leather laces. The leopard sock were made from a fuzzy synthetic fabric. Shoes: I purchased a pair of brown shoes in the wrong shade. 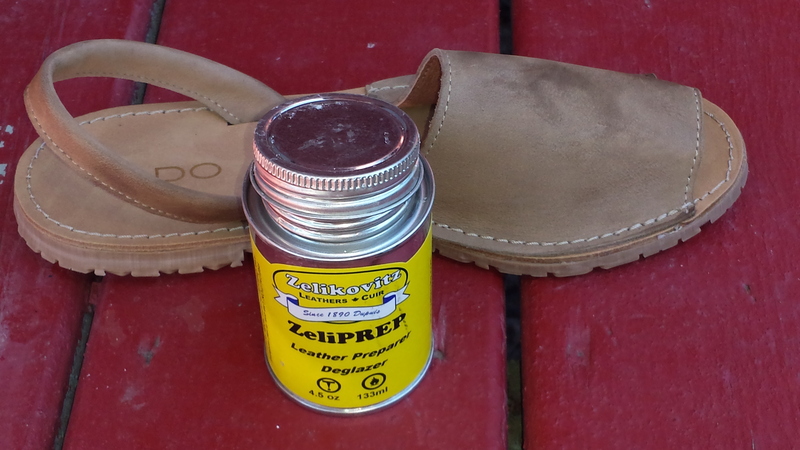 I prep them and changed the shade to a darker colour with leather dye. I added hot fix studs. 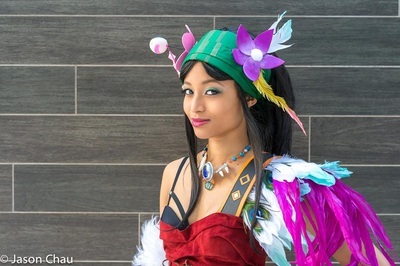 The gems are also floral decorations embedded in worbla. The feathers were coloured with Sharpies. 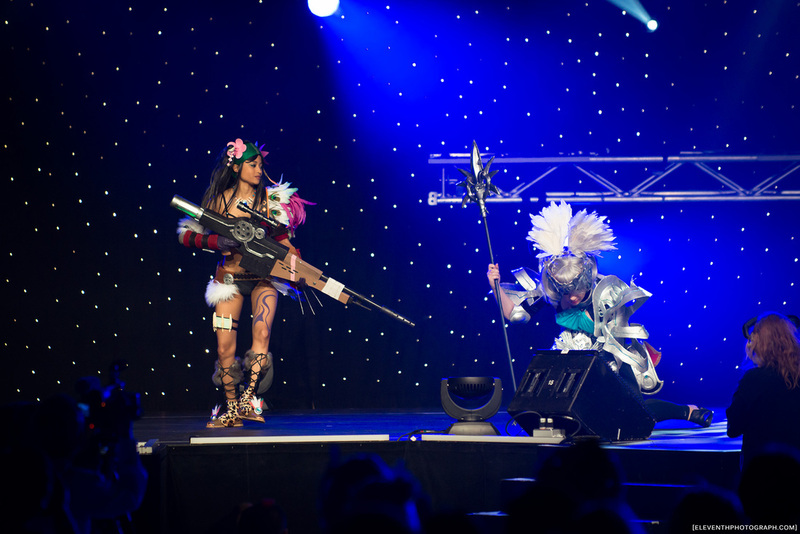 The worbla base has floral wire embedded in it and was hand stitched to the shoes. 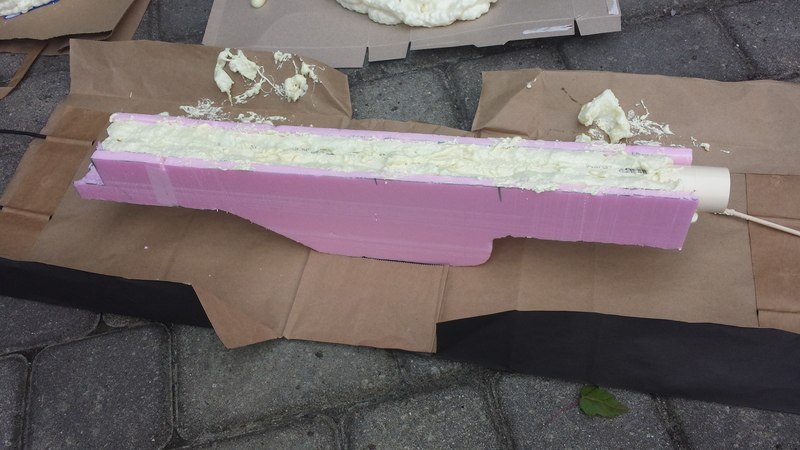 Rifle Prop: The base is pink insulation foam with a pvc pipe embedded inside for support. I used expandable foam to fill in the gap between the pipe and the insulation foam. The barrel is layered pvc pipe. 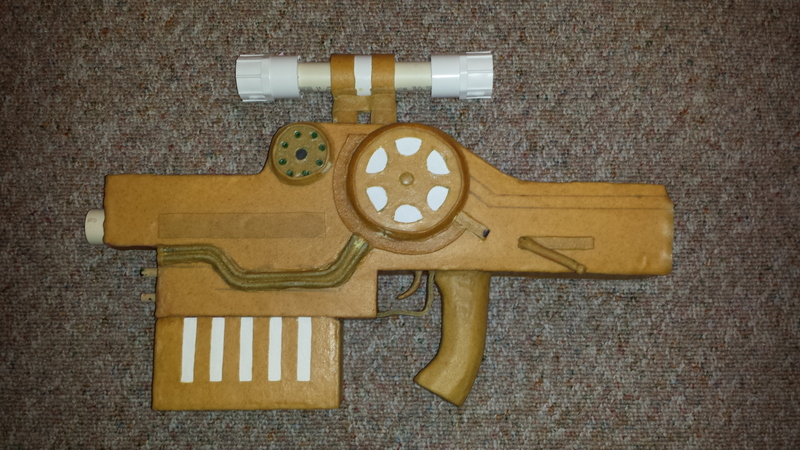 The “wood” is worbla covered insulation foam. 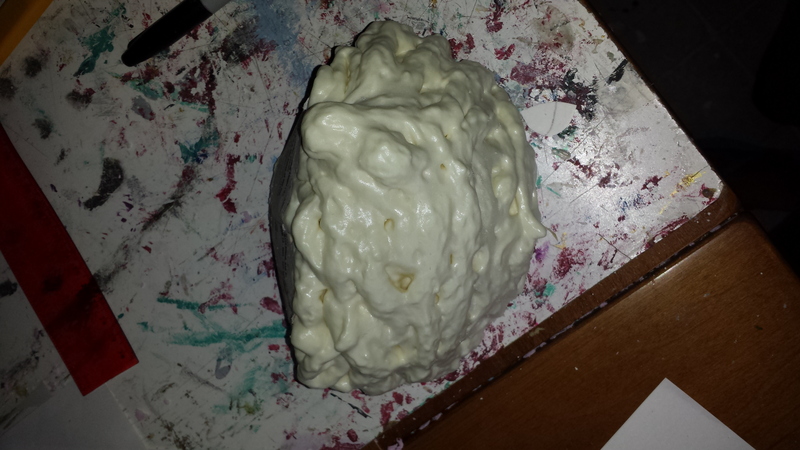 I added a layer of Bristol board to all the foam to have a smooth surface before apply the worbla. 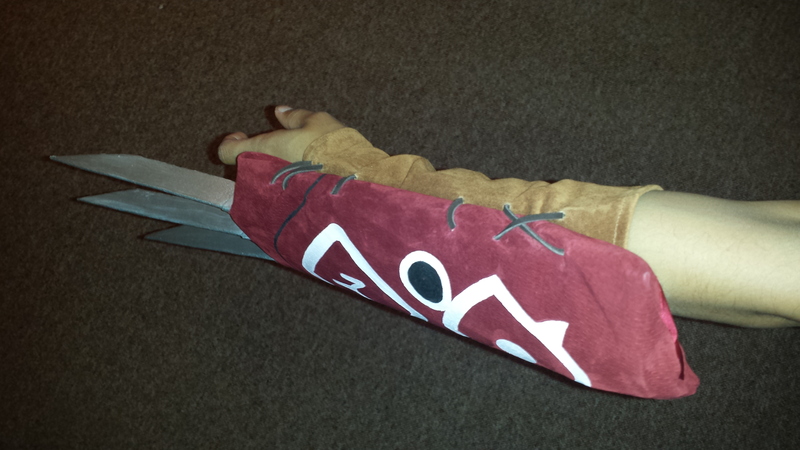 The clip is foam board covered with worbla. 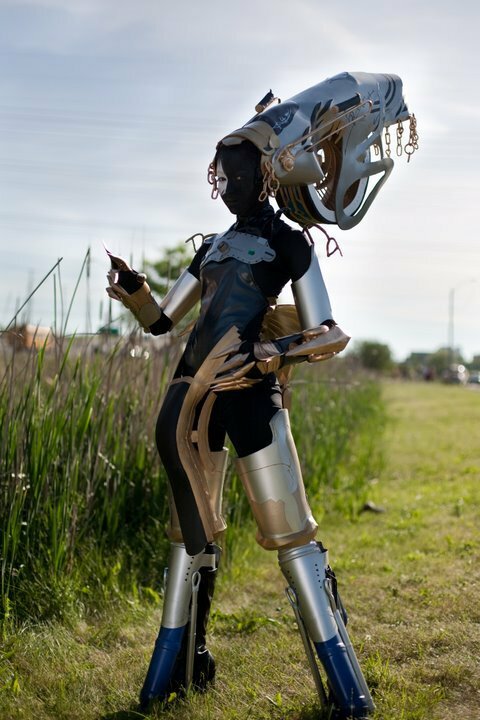 Raised details are a combination of worbla, craft foam, and straws. The scope is layered pvc pipe and has a cast resin gem for the lens. The end of the rifle is a water bottle covered in worbla with some curtain sheer inside to diffuse the LED lights embedded in the gun. The lights came from a signalling wand from the Dollarama. The bottle twists on and off and the barrel/wood parts come off by using a pvc pipe connector/joint for easy transit. Everything was dark washed or dry-brushed with silver to add texture.